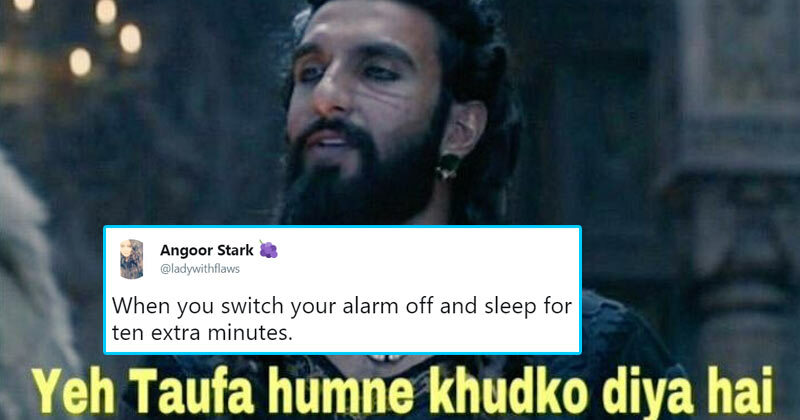 A particular scene from Padmavat of Ranveer Singh has turned into a meme and it was a dialogue that Singh’s character said, ‘Yeh Taufa Humne Khudko Diya Hai’. Padmavat was one movie that turned the entire country upside down with their views and ideals and what not. People supported some, hated some, but by the end of it all, everyone just absolutely loved the movie and couldn’t stop raving about it. Padmavat rolled in a huge box office collection and went on to become one of the biggest grosser of this year. All in all, Padmavat got its happy ending. Now, months after the release of the movie, one dialogue is doing the rounds on social media as the new meme in town. And, it’s none other than Ranveer Singh’s dialogue, ‘yeh taufa humne khudko diya hai’ which loosely translates to – I have given this gift to myself. People are pairing this particular dialogue with various self-care and self-love instances and we for one are absolutely loving them. Here are some of the memes that we loved and you’ll too, check them out here. When my friends say about my crush,"Bhai ye kyo nahi patau"
Boss : kis khushi mein? The Internet is filled with some crazy people, doing crazy things and thinking about crazy stuff, indeed.